1” larch on oak frames, fastened with bronze screws. Yacht laid teak deck over a marine plywood sub deck. 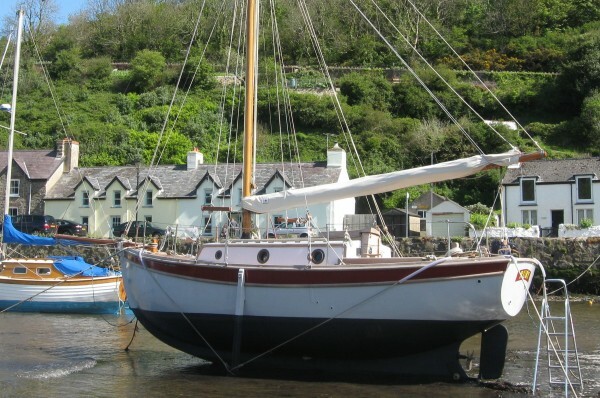 Galvanised strap floors with external lead ballast keel and stainless steel keel bolts. Self draining cockpit with a bridge deck, tiller steering on transom hung rudder. Big spacious cockpit. Gaff cutter rig on a solid keel stepped wooden mast with wooden slab reefing boom. Stainless steel standing rigging and rigging screws, renewed 8 years ago, to external stainless chainplates. Sails all by James Lawrence, 2005, include mainsail, topsail, staysail and jib. All in excellent condition. Vetus 16hp 2cyl diesel installed new in 2005. Only 57 hours. Centreline shaft to 3 blade propeller gives 5 knots cruising speed. Stainless steel 10 gallon fuel tank under the cockpit sole. Steps down over the engine box with a newly refitted galley to port and chart table to starboard. 2 burner gimballed gas stove and grill. Seating to port with a Jabsco sea toilet forward of this. Full length settee berth to starboard, full length V-berths forward. Interior is light and spacious, finished in varnished wood and white gloss paint.